This is so simple, it hardly deserves a recipe, but it can be served in a lovely fashion. Preheat the oven to 428 F / 220 C.
Place the thawed puff pastry in a small cup or bowl. Bake blind, for 15-20 minutes until golden brown or as directed on the package. Using 1/2 of the blueberries, make a sauce. Place 1/2 the blueberries in a saucepan, add the 2 tablespoons of sugar and the water. Bring to a boil until the berries have softened. Mix the cornstarch with a bit of water and add to the cooking blueberries. Allow the mixture to thicken, stirring continuously. Remove from the heat when the mixture becomes clear and thick. Meanwhile, drain the excess liquid from the yogurt by placing it in cheesecloth and allowing it to drip for 1/2 an hour. When the liquid has drained, place the yogurt in a bowl. Add the lemon juice and powdered sugar and mix well. Add the blueberry jam/syrup that was cooling and mix well. Add 1/2 of the remaining fresh blueberries to the yogurt and gently mix. 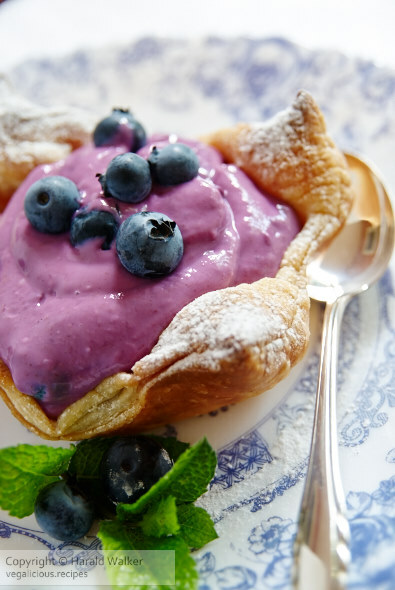 Place the blueberry yogurt in the puff pasty cups. Dust with powdered sugar and garnish with the remaining blueberries. 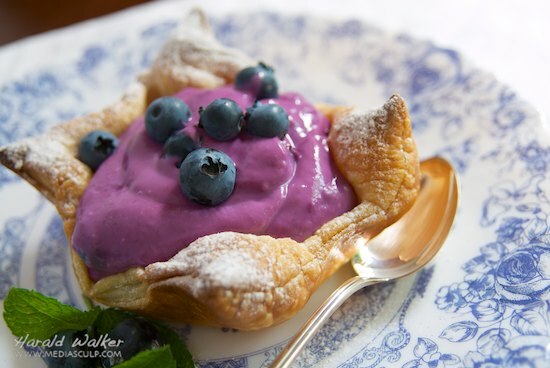 Posted by Chris Walker on August 20, 2012 in Blueberries, Desserts and Sweets, Puff Pastry, Soy yogurt.